Les Vogt's Performance Horse Program is now available for purchase online. Each series covers a wide variety of instructional content that is broken down into individual sections to make the learning experience easier. This way, if you need refresher on a specific section, you can go back and easily find that topic instead of having to rewind/fast forward through hours of video to find the instruction you're looking for. The series can be purchased in its entirety if you're looking to get the most out of the program, or you may choose to purchase the sections individually if you are looking for information regarding a specific topic. You may be tempted to watch this series from beginning to end and get to work. However, to get the most from this program, you need to be committed to starting from the beginning and working your way through - section by section. The Foundation Fundamentals Series is designed to be absorbed and put into practice one solid step at a time, with each skill building on the ones before. You are, after all, establishing a foundation for your relationship with your horse, and it's a process that just can't be rushed. This is why we have broken down this series into smaller, more manageable sections. The riders who will really enjoy the rewards of this program are the ones who take the time to work on EVERY exercise, not to the point they can do them right - but to the point they can't do them wrong. Watch this video to find out more information, and click the button below to buy now. 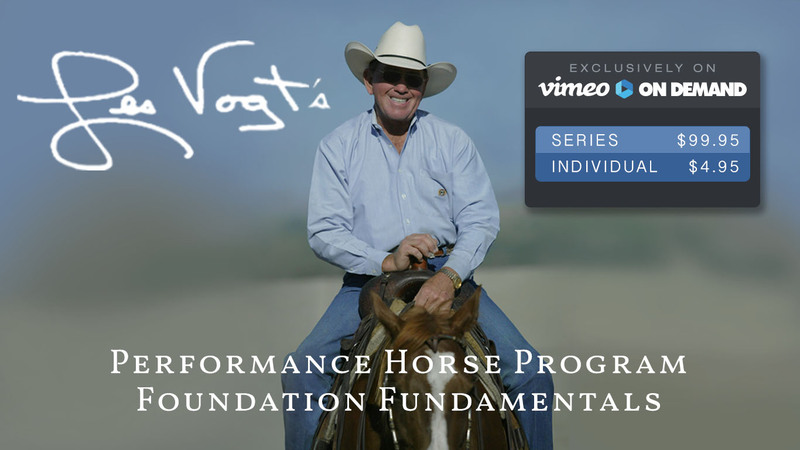 Les Vogt's Performance Horse Program - Foundation Fundamentals from Les Vogt on Vimeo.